It was a sign of the times in North Korea, where saber-rattling has been partially replaced by boosterish displays of the country’s economic development prowess. As some observers have suggested, this offers some hope for the dreams of a de-nuclearized Korean peninsula. But the building boom has been years in the making, as Pyongyang’s rapidly changing skyline illustrates. But what is new is Kim Jong-un’s focus on residential development. 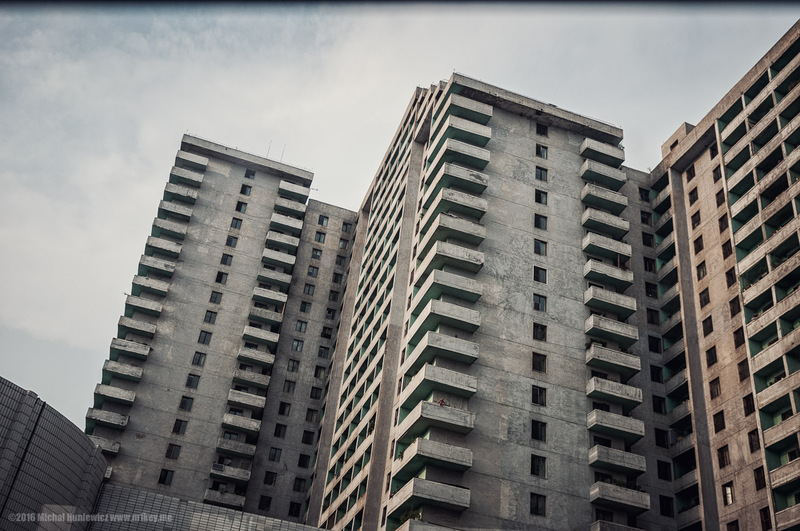 Recent visitors to Pyongyang have noted that a steady stream of new high-rises have pierced the capital’s skyline. The blueprint for this wave of development was formally set out in a 2016 manifesto attributed to Kim Jong-un, in which the author calls for the construction of a “socialist fairyland.” That’s an apt description for the boom’s aesthetic, developed by Paektusan Academy of Architecture, the country’s architectural gatekeepers. Most new buildings combine futurist design features like rooftop orbs and pyramidal designs with a pastel color palette, producing a bizarre aesthetic at the intersection of Epcot and Wes Anderson. It may be slight stylistic improvement over the nation’s previous obsession with Stalinist and Brutalist styles, which alternated from oppressively gaudy to oppressively spartan, but construction quality in North Korea remains suspect. Like earlier projects such as the infamous 3,000-room, never-opened Ryugyong Hotel, many of the new developments likely sit empty, serving as Potemkin show projects. But visitors have reported that even in occupied buildings, interiors are often shabby, with poor access to basic amenities like hot water. In 2014, a brand-new 23-story tower collapsed, reportedly leading to the execution of Choe Yong-gon, then deputy minister of construction and building materials. It might come as some surprise that North Korea, which has been economically isolated by strict UN sanctions, is capable of building much of anything at all, much less showpiece megaprojects. After all, the country’s heavily centralized economic system is notoriously inefficient; severe shortages of food, electricity, fuel, and medicine are still said to afflict the population. How is a desperately poor state building so much? North Korea’s future prosperity hinges on whether their unpredictable builder-president can play nice with our unpredictable builder-president. While a trickle of outside capital explains some of the boom, the real answer likely lies in the market-based reforms implemented over the past decade. Reportedly driven by North Korean economy minister Pak Pong-ju, these economic changes have juiced both the demand for housing and the construction of new supply. On the supply side of the equation, new development in cities like Pyongyang is increasingly financed by donju, or the entrepreneurs running many of North Korea’s quasi-private enterprises from within government ministries. Commonly translated as “masters of money,” donju are high-net-worth North Koreans with fortunes to invest and the business acumen to invest it. This has opened up new lines of credit for the nation’s construction agencies, funding much of the building reshaping the Pyongyang skyline. The demand side is coming from North Korea’s small middle class, which is growing for the first time in nearly a half-century. This shift again appears to have its roots in recent liberalizing reforms, with an estimated 40 percent of North Koreans now earning independent income in the private sector—a far cry from the public rationing that characterized much of the nation’s economic history. And with a middle class comes purchasing power. In addition to driving demand for cheap snacks and forbidden South Korean soap operas, this emerging consumer culture is also giving rise to nascent real-estate markets. Once strictly forbidden, desirable apartments are now openly traded on a black market, with state officials—themselves often involved in the trade—turning a blind eye. According to one estimate from Joung Eun-lee of the Korea Institute for National Unification, this has resulted in a tenfold increase in increase in housing prices since the 2000s. Of course, North Korea’s future prosperity hinges on whether their unpredictable builder-president can play nice with our unpredictable builder-president. President Donald Trump has joked about building beachfront condos in the Hermit Kingdom, but the idea is not that improbable—investors in China and South Korea are exploring real estate investments in North Korea. But even if the diplomatic thaw continues, developers eyeing opportunities to do business in one of the world’s most reviled states will still have to contend with North Korea’s state-run economy and disastrous human rights record, which will continue to justify economic sanctions in the near future. Pyongyang’s striking new skyline is impressive. But like the colorful military parades on September 9, it may be mostly for show.